Slava Voynov’s goal eight minutes into overtime gave the Los Angeles Kings a 3-2 win in Game 5 of Western Conference Quarterfinals over the Blues at Scottrade Center for their third win in a row. 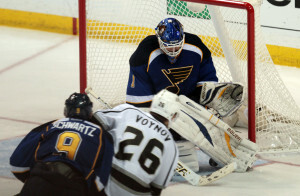 Voynov, who had one career playoff goal in 20 previous postseason games, beat Blues goalie Brian Elliott as the Kings broke out on a 3-on-2. The Kings won their third straight to grab a 3-2 series lead. The Blues, who won the first two games of the series at home, got the equalizing goal from Alex Pietrangelo with 44.1 seconds remaining. Elliott was pulled for an extra attacker, and David Backes won the faceoff and got it back to Pietrangelo. He skated to the middle of the ice and fired a wrister traffic past Kings goalie Jonathan Quick to tie the game. Alexander Steen also scored for the Blues, and Elliott stopped 22 shots as the Blues saw their eight-game home winning streak snapped. Jeff Carter scored twice, Mike Richards and Kopitar each had two assists as the Kings snapped an eight-game road losing streak dating back to the regular season. The Blues will try to force a game seven. They must win Friday night at Los Angeles.